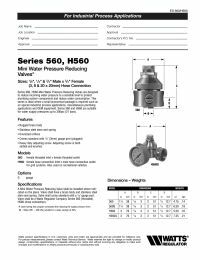 Watts Series 560 Mini Water Pressure Regulators (aka Pressure Reducing Valve or Pressure Limiting Valve) are used in industrial process applications to regulate water pressure in systems requiring a small economical regulator package. They are ideal for use in miscellaneous plumbing applications and OEM equipment such as travel trailers. Note: This pressure regulator contains more than 0.25% lead and is illegal to use in any plumbing system providing water for human consumption anywhere in the United States.